Arthur Guinness Day – What Are We Celebrating? Hi Guys! Another exciting day is around the corner; the Arthur Guinness Day celebration. On this day, Arthur Guinness is celebrated worldwide and true Guinness Foreign Extra Stout lovers, the world over, traditionally hold the 27th of September as their own epic day of celebration where they toast to the legacy of Arthur Guinness. Nigeria is not left out in this worlwide celebration as we and the rest of the world raise our glasses to Arthur on this day and celebrate a truly inspiring brand, Guinness Foreign Extra Stout. 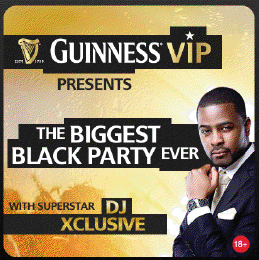 In the spirit of true brotherhood, Friday September 28th, 2012 has been set aside to celebrate with you and it’ll be going down at an all exclusive Guinness VIP Black Party taking place at La Mango Restaurant & Bar – 2, Adekunle Fajuyi Street, GRA, Ikeja by 17:59!!! Guinness lovers all over the world will be joining us in raising glasses and toasting to Arthur in recognition of the remarkable heritage this iconic brand represents, Guinness. this epic day, join in the celebration! Dress code – Black and Trendy. Want to stay in touch with everything football, lifestyle and entertainment? Just join Guinness VIP. SMS ‘Yes’ and your Date of Birth to ‘1759’ and you’re in. WILLOW SMITH DROPS OUT OF SCHOOL.